Findus sent me a few gift vouchers which I could use at my local Pick n Pay to buy which ever of their vegetables I chose. I had an idea for a carrot purée ravioli lurking in my head and decided to use the vouchers to buy the frozen baby carrots. I would not ordinarily buy frozen carrots but for this recipe it made perfect sense as baby carrots are easier to work with when making a purée and the hard work of peeling the carrots had already been done for me. The trick is to get the carrots super soft. You want to be able to mash them with the back of a spoon. The other reason for making this dish was that I had read you could freeze ravioli. I find it easier to make a big batch and so I set about making enough for Dave and I for one meal as well as enough for us to have as a starter the next time we had guests. Once the ravioli were made I placed them onto a tray without overlapping them. I then put the tray into the freezer. As soon as the ravioli had frozen I put them into a freezer container. When we were ready to use the frozen carrot purée ravioli I brought a pot of water to the boil, added some salt and then the frozen ravioli. As soon as the water came back to the boil, I started the timer. And they were perfect! I am so going to repeat this the next time I make pasta. We served our ravioli with a crayfish bisque and crayfish tails that were cooked for 4 minutes, out of the shell. Blog-checking lines: This month, the Daring Cooks challenged us to think inside the box – the icebox, that is! Audax taught us some really cool tips and tricks for stocking our freezers with prepare-ahead meals that can keep us our taste buds satisfied even during the busiest of times. Disclosure: I was sent the gift vouchers but was not required to write a blog post or recipe in exchange for them. This post is in line with my blogging policy. 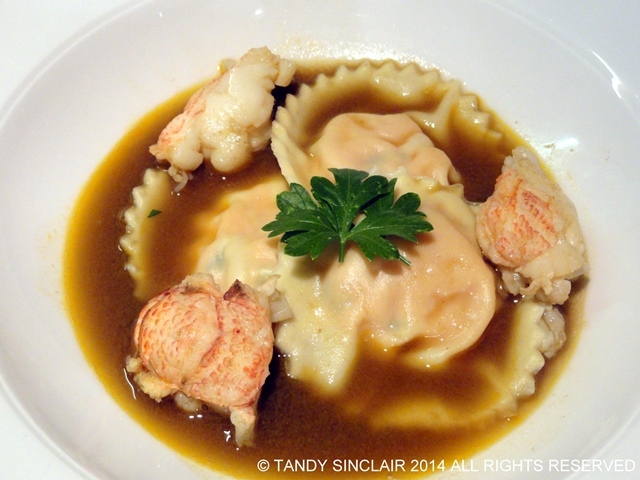 wow, love the idea of these ravioli served with crayfish. How luxe! I was a long time ago, that I made fresh pasta, let alone ravioli! I made it & loved every bite of the filling & pasta too! Crayfish ravioli, yum! Thanks for the freezing tip, too! These look so good! Love the non-traditional filling you went with. I am always so impressed by anyone who makes their own pasta, Tandy. That has been on my food bucket list for far too long! What a great idea to stuff the ravioli with smashed carrots! Hi Tandy, What a wonderful idea, I bet this is delicious! These sound so simple! Making extras to freeze is a great idea! These sound lovely, Tandy, now if I could only get JR to eat pasta! Gorgeous idea for ravioli and I love that you served them with a delicious bisque, very nice indeed! What a heavenly meal Tandy!